MNA – President Hassan Rouhani, while calling for stronger relations with the Philippines, said private sector could play a major role in development of bilateral cooperation. 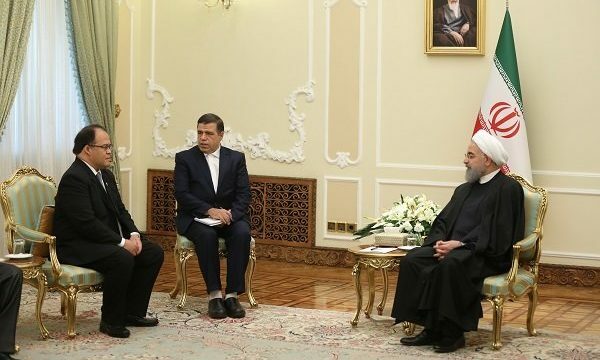 Hassan Rouhani, President of Iran, made the remarks while receiving credentials of the new Philippine Ambassador to Tehran, Wilfredo C. Santos, on Saturday. Pointing to significance of joint investment and the need for Tehran and Manila to boost economic activities, the Iranian President urged private sectors of the two countries to become familiar with each other’s capacities as an effective means of bolstering bilateral economic ties. He later touched upon recent victories of the Philippines in the fight against terrorism expressing hope that the world will succeed in uprooting the scourge of terrorism. “I hope joint and global effort will lead to complete elimination of terrorist groups,” said the Philippine ambassador to Tehran. He later recalled that his country was to host the 31st Asean Summit and voiced optimism towards active participation of the Islamic Republic of Iran. The ASEAN Summit is a semiannual meeting held by the members of the Association of Southeast Asian Nations in relation to economic, and cultural development of Southeast Asian countries. The 2017 edition will take place from 13–14 November 2017 in the Philippines.